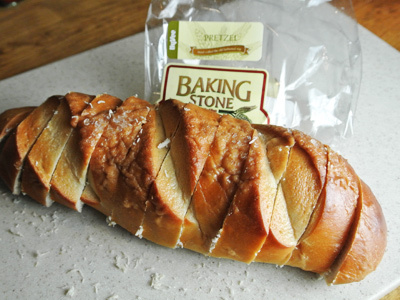 I love pretzel bread and every time I pick up a loaf I think of those big soft pretzels with cheese dip. 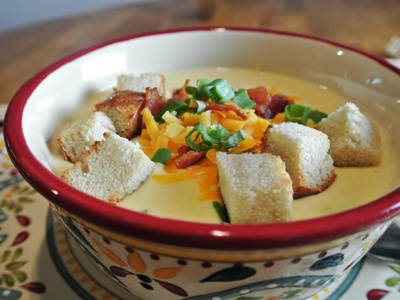 After giving it some thought, I decided to make a Cheddar Cheese Soup and toss some toasted pretzel bread croutons on top. They were so delicious, a little crunchy on the outside and that soft pretzel like taste on the inside. 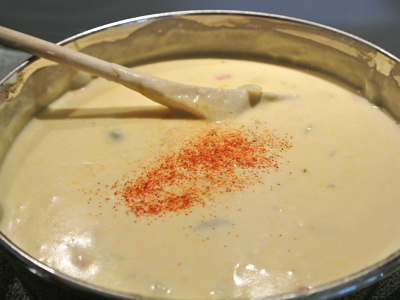 I was craving a cheese soup with a little southwest flare so I added some roasted Poblano chiles and Fresno red peppers. 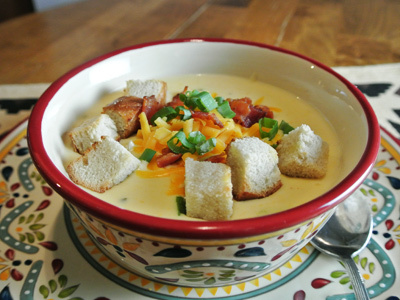 A creamy Queso like soup! I’m starting off with roasting a couple Poblano chiles, a couple Fresno Red pepper and an onion. I also wrapped a couple cloves of garlic in aluminum foil and placed on the broiler pan for about 5 minutes. Place the peppers and onion in the oven under the broiler setting at 500 degrees. When the chiles begin to char, rotate every few minutes to char on all sides. When ready, place the chiles in a plastic bag and seal for 15 – 20 minutes to sweat it out. They will easily peel under running water. Remove the onion when they have softened and become translucent. After you’ve peeled and removed the seeds from the chiles, chop them into a small dice. Dice the onion and smash the garlic into a paste. 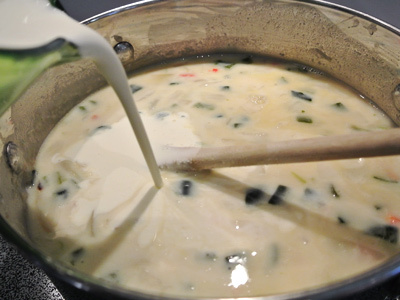 Melt 4 tablespoons of butter into a medium or large saucepan. Add about 1/4 cup flour to make a roux. If it is too thin, add a little more flour, if too thick add another pat of butter. Stir for a couple minutes until it becomes bubbly and begins to brown. 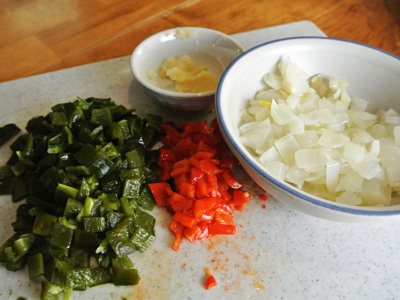 Add the chiles, onions and garlic. It will become pasty when stirred. Begin pouring in the chicken stock. Next, pour in the half and half. You can use whole milk, I only had half and half so that’s what I went with. And the heavy cream. Turn the heat down to low and let simmer for about 20 minutes. While the soup is simmering I’m going to slice the pretzel bread into cubes. Drizzle with olive oil and place in an oven or toaster oven set at 400 degrees for 5 – 7 minutes. 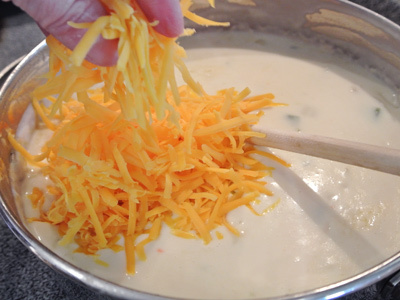 Begin adding the cheese about 1/2 cup at a time, stirring after each addition until the cheese has melted. For a little extra kick, add a couple dashes of Cayenne pepper. Sprinkle some toasted pretzel croutons, shredded cheddar cheese, bacon bits and green onion on top. 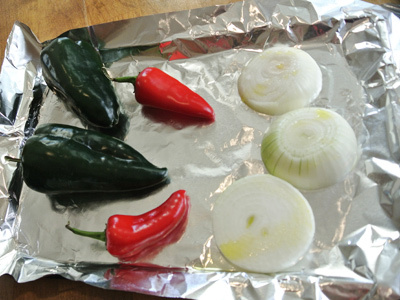 Place the chiles, onion and aluminum wrapped garlic cloves in the oven set at the broiler setting of 500 degrees. Rotate chiles often to char on all sides. Slice the onion thick and place on roasting pan along with chiles. Drizzle with olive oil. When onion becomes soft and translucent remove from oven. Place chiles in a plastic bag and seal for 20 minutes to steam. Remove aluminum wrapped garlic after 5 minutes. Peel chiles under running water, remove seeds and chop. Chop the cooled onion and smash the roasted garlic. Set aside. 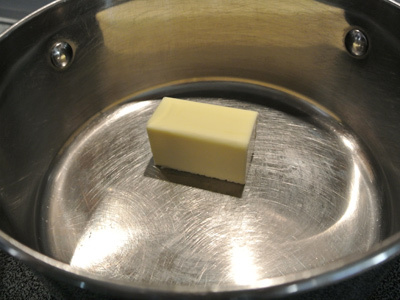 Place butter in a medium saucepan and melt. 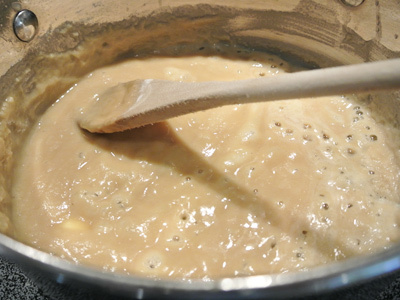 Add flour and stir for 2 – 3 minutes making a light roux. Add the chiles, onion and garlic to the pot and stir. Slowly whisk in the chicken stock, milk and heavy cream. 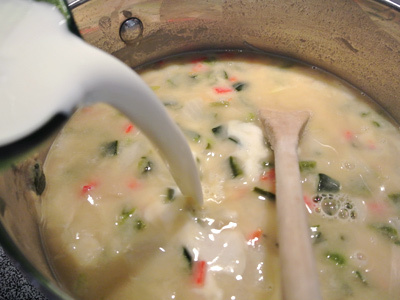 Bring soup to a low boil, then turn the heat down so that the soup barely simmers for 20 minutes. Begin adding cheddar cheese by a half cup increments stirring after each addition. Add the cayenne pepper and salt to taste. 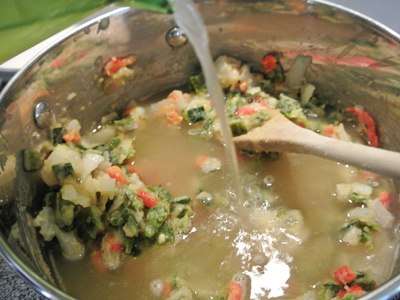 Soup should be thick and flavorful. Cut pretzel bread into cubes. Place cubes on a baking sheet lined with aluminum foil. Drizzle olive oil over top and bake 5 – 7 minutes at 400 degrees in the oven or toaster oven. 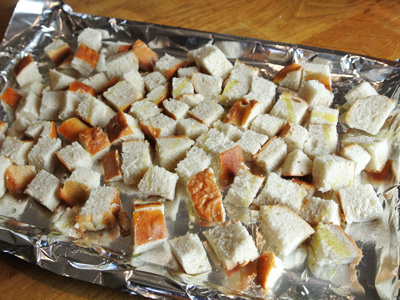 Croutons should be lightly toasted on the outside. 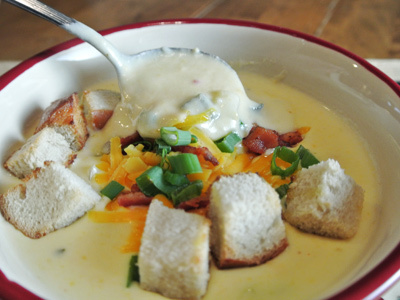 Ladle soup into bowls and top with pretzel croutons, grated cheddar cheese, sliced green onion and bacon bits. That looks so hearty and delicious! Yum. Can’t say no to soup, especially one with all that topping!